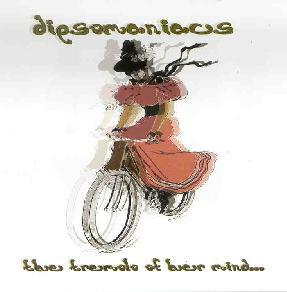 Dipsomaniacs - "The Tremelo Of Her Mind... The Strings Of Her Soul"
Early 21st century: a piper is spotted, loitering about the gates at the dawn of a new millennium. Vibrating, grooving, ingesting key late sixties influences, the minstrel, a quadrophrenic, arctic monster, seduces us with its inspired melodies and meanderings, wearing oh so proudly these influences: latter-era Byrds, Gram Parsons, the Grateful Dead, the paisley underground of the mid-80's, and perhaps most conspicuously: Syd Barrett-era Pink Floyd. Not to mention a dash of Physical Graffiti-era Zeppelin. Happily, the minstrel has morphed into the The Dispsomaniacs, a quartet of Norweigan psychedelic disciples who present for your auditory pleasure a quintet of sonic excursions described by Singer/guitarist Oyvind Holm as 'our trip to Mars'. Well, maybe not the Red Planet, but certainly the dark side of the Moon had a hand in inspiring these guys. Superlative tracks on this forty-seven minute opus dazzle and delight: "Miles Away" is a mellow, Goran-Olsen trombone spiked, moog-noodled, David-Gilmouresque slide n' echoed guitar opener, dissolving into the acoustic guitar gem before painting your murals, featuring Holm's Jerry Garcia-styled vocals. "Dipso Raga#1", another trippy acoustic romp, is cradled by a keyboard effect reminiscent of that of In the Light (Led Zeppelin's Physical Graffiti) is punctuated by a Chicago-era trombone spiking, tablas and otherworldly breathing and sighing. Priceless! "Hear Me, Take Me" is a hypnotic acoustic number featuing a kaleidoscopic array of instrumental touches: guitar, xylophone, harmonica flourishes, brushing cymbals, trombone, and even haunting humming, again with the horn spikes. "In Syd's Garden" comprises a most perfect tribute to the great Barrett of yore – a flat-out psychedelic romp that features echo chambers, fading, lots of trippy Hammond organ, and then moves into a psycho-rock stomp that barrels along, taking us on an preternatural ride of some twenty minutes plus, completely enclosing consciousness. To describe this disk as a hypnotic delight would be akin to likening Floyd's Interstellar Overdrive to good reefer – this is one of the best experimental slabs of tunage I've heard in the last ten, nay, twenty years! For anyone with an ounce of curiosity about old skool psychedelia and how it's being woven into the low-fi aural tapestry of a third millennium, look no further: The Tremelo Of Her Mind...The Strings Of Her Soul is a primer extraordinaire. For more information you can visit the Free City Media web site at: http://www.FreeCityMedia.com. Contact via snail mail c/o Free City Media; 2999 California St #75; San Francisco, CA 94115.